He is the most enthusiastically praised and the most violently denounced politician in Bulgaria's modern history, and what could be a better proof that his extraordinary personality. Born in Turnovo in 1854, he made his way into political life after the Liberation of Bulgaria in 1878. He was a student at the Odessa Seminary, an envoy of the Central Revolutionary Committee in Bucharest, leader of the suppressed uprising in Stara Zagora in 1875, head of the 1876 April Uprising in the region of Turnovo - indeed, he participated in all stages of the national liberation movement. He also wrote a book of poems, called "Songs and Poems by Botyov and Stambolov", and worked as a journalist for the Nova Bulgaria newspaper. And there was a lot more than that in his versatile and complex personality. In the first post-liberation years he threw himself with equal energy and ambition into the struggle against the Treaty of Berlin, into the formation of a Liberal Party and into parliamentary debates. Stambolov actively supported the 1885 Unification of the Principality of Bulgaria with Eastern Rumelia. And when Bulgarians were called to defend their Fatherland in the war with Serbia, Stambolov, who was at the time Chairman of the National Assembly, put on a soldier's uniform. He was not one of Prince Alexander Battemberg's admirers. in fact, he opposed the Prince's absolute power and demanded the restoration of the Turnovo Constitution. But in a moment which was crucial for the state he was the one to oppose Prince Alexander's abdication. His resolution and his ability to distinguish the possible from the impossible turned the former revolutionary into the most influential and respected politician of the Principality of Bulgaria. He was the natural choice for a first regent during the brief interim preceding the selection of a new monarch. Stambolov displayed the best of his political talent as Prime Minister from 20 August, 1887 to 17 May, 1894. His rule represented the strongest push for Bulgaria's overall development towards European standards. 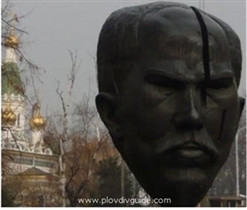 He was responsible for Bulgaria's modernization in economic, political, administrative and cultural aspects. His laws revealed a modern statesman's way of thinking. foreign diplomat once exclaimed. Striving for economic and political development, he built a complex transport network, created laws which promoted agriculture, provided government protection for locally produced goods, and signed favorable trade contracts with the large European states. He sought to improve health care, local self-government, culture and urban development. On the other hand, Stambolov's adversaries had much to blame him for: authoritarian rule, violent treatment of political opponents, persecution of the opposition. Despotic, ambitious and militant, Stambolov did not care about obstacles when pursuing an objective. His purposefulness eventually led to a clash with the no less ambitious Tsar Ferdinand and sealed his political fate. In Western Europe, Stambolov has been referred to as "the Bulgarian Bismarck". The strength of his foreign policy also reminded some of the German "Iron Chancellor". Many historians describe him as a "Russophobe" because of his daring decision to break off relations with liberator Russia. On the other hand, he did not rely on the West, either, telling Bulgarian diplomats, "We can never count on Austria because of our interests in Macedonia". Stambolov carefully maintained the internal political independence of his country. He sought diplomatic support in Britain and Austro-Hungary, but his commitment to London and Vienna in no way impaired Bulgaria's national interests. He tactfully pursued a peaceful consolidation of Bulgarian church and education in Macedonia. He was the only person able to bring the "Bulgarian issue", which sprang from the severance of relations with Russia and the lack of international recognition of Tsar Ferdinand, to a successful resolution. After meeting with him, monarchs, aristocrats, diplomats and statesmen invariably felt respect for Stambolov. He was slain by compatriots a year after he had resigned as prime minister, in 1895, at the age of 41 - the usual lot of a statesman born before his time. The information has been taken from Bulgaria.com, Rulers of Bulgaria section.